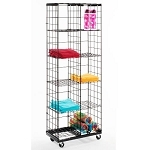 Showcase several pieces of retail products in a limited space with this Mobile Triangle Grid Display. Make the maximum impact with your patrons by filling this grid display with clothing, garment accessories and the newest most popular items on the market. You can use any of the 3-inch grid and shelving accessories on this mobile display which is going to allow for one outstanding set up. Locking casters keep this metal rack securely in place while giving you the ability to move throughout your location for a refreshing new appeal. 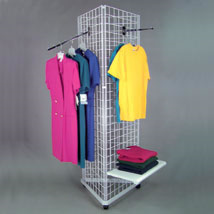 Add to your business today by ordering the grid display rack in one of three fashionable colors while saving yourself time and money plus the added benefits of increasing your sales figures. Buy yours today at Candy Concepts Inc.